In our restaurants you experience elegant ambience with fantastic views, whether you are having a romantic dinner or are in festive society. 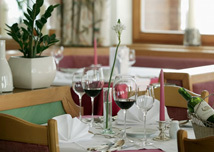 Enjoy our diverse dishes in one of the three non-smoker restaurants. Sitting next to the generous windows of the panoramic restaurant, you can experience the breathtaking mountains from close by. The comfortable furniture and wooden floor lend a rural character to the room. The white drawing room combines simple elegance with Tyrolean cosiness. 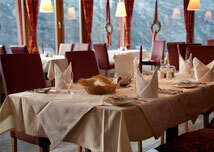 The alpine rose restaurant with its numerous niche tables offers the perfect opportunity for romantic togetherness. 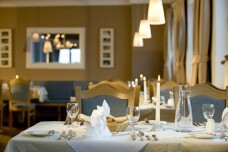 However, for bigger companies larger tables can be laid.